A short distance from Oristano, passed city from the illustrious one that conserve in the beautiful historical center some monuments of pregio like the tower of Mariano, the church of Saint Francisco, the Dome of Assumed and the interesting Antiquarium Arborense, famous all over the world for the Sartiglia, giostra to horse that runs every year in occasion of the Carnival, finds the village of Torre Grande, rising above one of the most beautiful beaches. 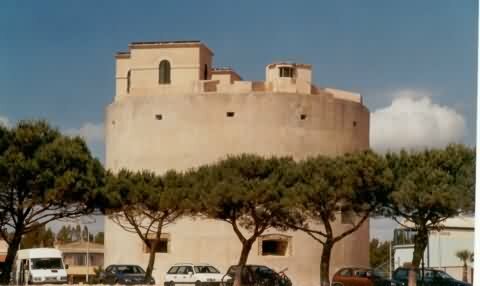 It is here that the greatest coastal tower of Sardegna rises, called Torre Grande. Constructed in several stages, it was first built in the first half of the 1500's, has cylindrical shape with a diameter of base of 20 m. Over the access door opens a balcony with beautiful mensoloni, while on the terrazzo, to 17 m of height, in the 1800's came added one small room for the powerful signalling light. Oristano is not in the coast, but the beautiful Torre Grande beach is not very far from it. In this beach you'll find the biggest tower of Sardinia, characterised by a cylindrical shape and a basement with a diameter of almost 20 m. It has been built by order of Filippo II of Spain with the aim of protecting the harbour from the Saracen raids. Afterwords the tower became a lighthouse and in 1880 the lighthouse keeper's house has been built. Torre Grande is a famous tourist destination, plenty of resorts, that in the summer period counts more than 20.000 inhabitants. Located in Marina di Torre Grande, about 6.5 km west of Oristano at the northern end of the Golfo di Oristano.